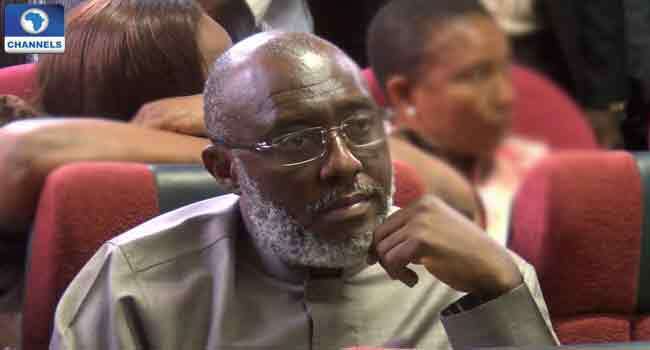 A former National Publicity Secretary of the Peoples Democratic Party (PDP), Mr Olisa Metuh, has accused the All Progressives Congress (APC) led Federal Government of intimidating him. He said this in a statement on Saturday, one day after the Minister of Information and Culture, Mr Lai Mohammed, release a list of some Nigerians who allegedly looted the nation’s treasury. According to the list, the former PDP spokesman is on trial for allegedly receiving N1.4bn from the office of former National Security Adviser (NSA). Metuh, in his response, said, “The APC led Federal Government resorted to all kinds of dirty tactics to dehumanise and intimidate me. He noted further that by the publication, the Federal Government breached the constitution by “seeking to burden” him with two criminal trials on the same charge – one before Justice Okon Abang and the other before the media. The former PDP spokesman who is also a lawyer said since his arrest on January 5, 2016 and subsequent arraignment, he has refrained from publicly discussing the issue because it was wrong to discuss a matter that is sub judice. He stated, however, that he has decided to avail the public of the “true state” of the case against me in order to defend his name and integrity. Narrating how it began, Metuh said, “The charge against me is that I received the sum of N400 million from the Office of the National Security Adviser to carry out duties assigned to me as the then National Publicity Secretary of the PDP by then President and Commander in Chief of the Armed Forces of the Federal Republic of Nigeria. The major crux of the prosecution argument is that I ought to have known that the money was a part of an alleged and yet to be proven unlawful activity of Colonel Sambo Dasuki (rtd), former NSA to President Goodluck Jonathan. The lawyer claimed that while the alleged illegality of the funds has neither been established in law nor in fact, he never held a government office or position and could not have had any access to government funds. He also accused the government of plot to taint the PDP before the elections, alleging that that was why he was not allowed to attend to his deteriorating health despite several expert medical opinions on the matter. “By going to the media to name me a looter (without cross-checking the definition and dictionary meaning of the word), the Federal Government has not only given a body language but has issued a direct intimidation and threat to the judiciary to get a compulsory conviction,” Metuh claimed. He further accused the government of interfering and seeking to control matters within the purview of the legislature and the judiciary. The former PDP spokesman, however, said he has asked his lawyers to review the implications of the list published by the government and take appropriate steps for redress.